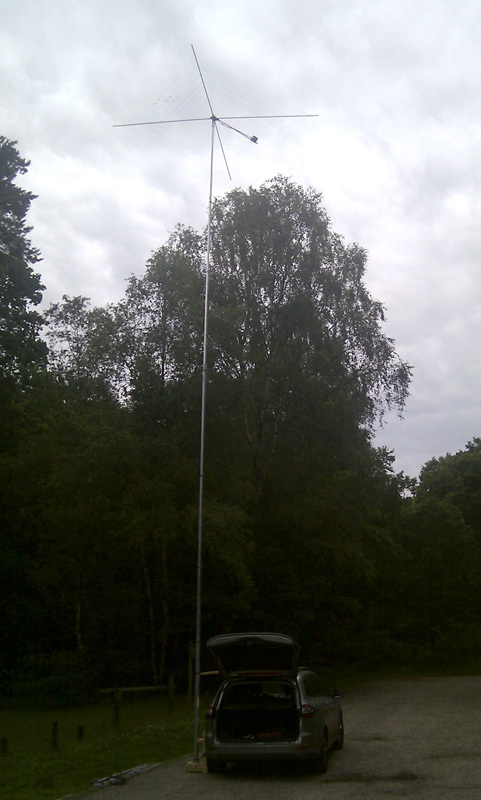 As planned I went out with my new aluminium mast, the home made Cobwebb, the yagi and the usual end fed wires, poles and radio stuph. It took me far more time than I expected to set up the station. The Cobwebb was a mess and setting up the telescoping mast proved quite a muscle job. In the end I did not have the time to raise the yagi, but I was able to test the Cobwebb vs. the half wave end fed. The first antenna I got up in the air was the Cobwebb. The aluminium mast stayed almost completely upright (just a tiny bit of tilting) without guying, carrying the 2kg antenna. I was able to push the mast out to 12m (40ft). That was good news! ..and indeed, when I fired up the radio 10m was dead, 12-15-17m were quiet with some EU stations and QSB and even 20m was not very good with strong QSB. I settled for 20m as it was the most lively band, hoping to catch some DX there. 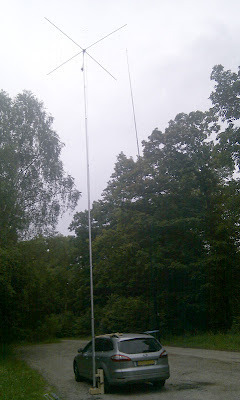 I set up the 20m end fed wire (12m high, feeding point @ 2m) next to the Cobwebb to be able to compare the two antennas. About 20 OMs participated in the test. Only one of those counts as DX (UA9 - 4000km), the rest of the stations were EU stations within the 2000km range. QSB was strong, making a comparison dificult. Switching quickly between the two antennas I was able to get a fair idea however, both on RX and on TX. Almost all of the stations reported one S-point difference of the Cobwebb over the vertical. I noticed the same on RX. The difference was more apparent when the other station used horizontal polarization. When the other station was using vertical polarization the picture is somewhat fuzzy (sometimes the Cobwebb was stronger, sometimes the vertical). If the difference I got in this test (+1 S-point) is the typical difference on all bands and all distances I would not consider switching to the Cobwebb as my /P antenna as it is far less practical to use. However I was not able to assess the DX performance - the reason to even consider using another antenna than the end fed wires - of the antennas, nor was I able to test the higher bands. I would expect the Cobwebb to perform better on the higher bands as its relative height increases when the frequency increases. So, enough reasons to repeat this test. If I can find another few hours to slip away from other duties at a time that propagations are good enough for serious DX-ing I will post an update on the results. Thanks to the OMs that participated in the test. Die Cobwebb is redelijk handelbaar met 2kg. Ingeschoven is de mast 2,2m - dus ruim boven het dak van de auto en voor mij nog goed te bereiken (ben bijna 2m - dat helpt). Dan zet je een Cobwebb er zo op. Maar de mast zelf is zwaar uitgevoerd om 'm niet te hoeven tuien. Ben erg benieuwd naar de DX performance. Een dipool op een golflengte hoogte zou het ook goed moeten kunnen doen (lager gaat de afstraling teveel omhoog). De voet heb ik gemaakt van hout omdat ik te weinig gereedschap heb om het van metaal te maken (zou het wel minder lomp worden). Het is dan ook geen "drive on"-voet maar een voet die ik vastzet aan het wiel. Interessant verslag. Ik begrijp dat je uitschuifbare metalen mast toch wel een stevige jongen moet zijn. Ik was bang dat 2 kg topgewicht problemen zou geven. Maar niet dus. Jammer van de slechte condities. Wat Bas schrijft klopt, verticale afstraling is beter voor DX. Dus ik ben heel benieuwd wat de resultaten zullen zijn met DX. Al met al een interessante en leuke test wat zondermeer vervolg nodig heeft om een juist oordeel te vellen.